Get ready to boost your productivity even further with Pagico 7! In case you are not a Pagico user currently — Pagico is all your tasks, notes, files, projects and clients in one elegant package. It combines data organization with task management, and it’s very easy to use. And if you’ve been using Pagico in the past, definitely check out Pagico 7 as well. It’s our best product yet with dozens of highlight improvements. Watch the video to see the highlights, and read on for more detailed improvements! In Pagico 7, you can just type your task title, and Pagico will intelligently scan it for dates and times and assign them to the Start & Due fields. Everything happens automatically as-you-type. It works very well and there is no configuration needed. In Pagico 7, you can also color-code projects and contacts with just a few clicks. The color selection of the container will be shown in the title area, as well as the icon of the list views. Have lots of stuff in your projects can make it difficult to quickly locate certain items. But that’s about to change! Everything can now be organized by their type. Lists and tasks will always be arranged together, then followed by notes and files. This new layout option can give you a quick overview of all the items you have and lets you to quickly jump to any section with a single click. The cross-link capability is one of the most loved feature by our users, and it’s definitely one of Pagico’s strengths. In Pagico 7, we completely redesigned the way linked items are shown. The new metadata panel makes better use of the space available and brings up the linked items. This makes it easy to quickly see all the linked projects and contacts. 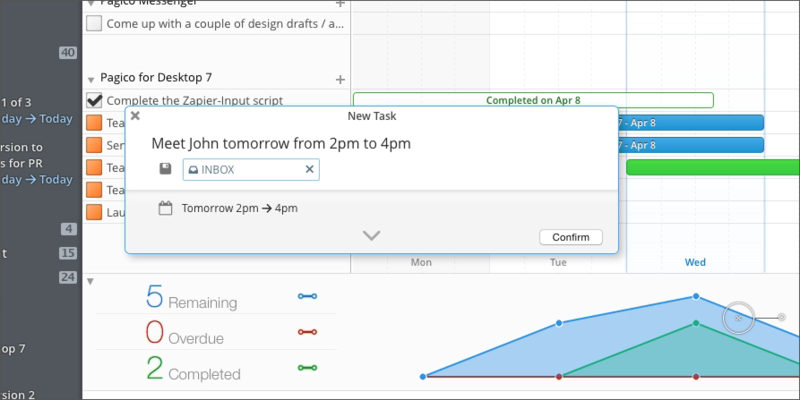 We’ve also redesigned the way inbound tasks are displayed. Previously located in the footnote area, the incoming tasks and notes are now promoted to the top of projects and contacts, making them much more visible. In addition to the layout change, Pagico 7 will also include those inbound links in the container-specific flowchart, so that you can see everything assigned to the current project or contact in one place. In case you didn’t know — Zapier is an awesome service that creates automation across applications. For instance, you can turn newly received email messages into Evernote notes, or convert a Google Calendar event into email invitations to your colleagues, etc. It is a really cool concept, and users can come up with amazing automations that saves considerable amount of time. And of course, you can customize the connection any way you like. You can configure to only trigger the automation if the incoming event matches certain keywords, and you can choose precisely where the incoming data will be saved in Pagico. It could be your Pagico Inbox, or any specific project (or contact) in your workspace. It’s really amazing. 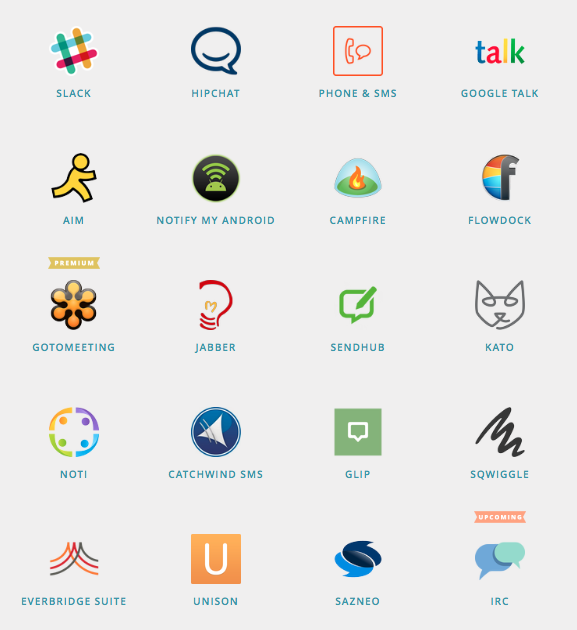 Besides these features for single users, Pagico 7 is also heavily optimized for small teams. In Pagico 7, you will see a contact profile that’s automatically created for you and displayed with a blue star. This will be the “myself” contact, representing you in workspaces. Simply share this contact in all your workspaces, and people can start delegating tasks to you in a number of ways. Remember the new Inbound Link section? That’s where tasks assigned to you will be displayed. Even better, all these items will also be included in the container-specific flowchart. That means you can see every task and appointment that’s related to the current container in an interactive flowchart. Pagico 7 made creating links even easier. Have a task to assign to a teammate? Simply type [teammate name] and you’re set. Now that Pagico 7 offers auto-complete as-you-type, so you can create links quickly and accurately. In teamwork scenario, it’s important to get notified about things that are related to you. So we’ve improved the notification feature in Pagico, so it can intelligently alert you about things that involve you, or projects and contacts that you bookmarked, while keeping you away from distractions (things that you don’t really care). The notification will also be fired as Notification Center messages, so you can get notified even when Pagico is running in the background. As you know, Pagico 7 can talk to thousands of apps out there via Zapier, allowing amazing automations that can save tremendous amount of time for your team. Want to get a slack notification when a new file is added to a project? Done. Need email notification when a task is assigned to you? No problem. It can be a real time saver and we’re really excited about it. Pagico 7 is now available for Mac and Windows (ubuntu package coming in just a few days), and the licensing cost remains the same ($50 for single user licenses, or $25 for license upgrade). But, to celebrate the launch of this major update, we’ll give you a $15-off (that’s 30%!) instant discount for new license purchases and $10-off on license upgrades from May 5 through May 15. That makes new licenses only $35 each, and license upgrade for just $15! As usual, Pagico 7 comes with a 15-day free trial. And even if you’ve used the free trial before on an older version of Pagico, you’ll still get another free trial (although only 5 days) to let you get a feel of the new version. So, what are you waiting for? Head to the Download Section and grab Pagico 7 today!